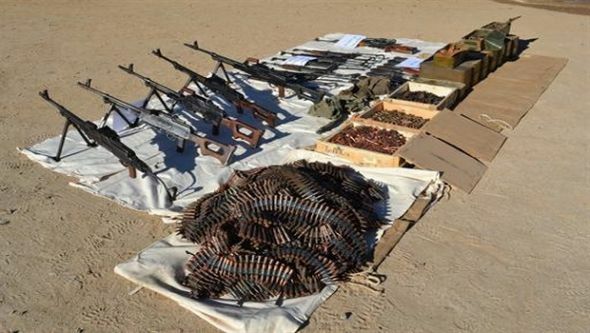 Foreign terrorist arrested in Bordj Badji Mokhtar - The Maghreb Times ! ALGIERS- One (01) foreign terrorist was arrested Friday, in Bordj Badji Mokhtar by a detachment of the People’s National Army in a clash with armed terrorists said Saturday, the ministry of national defence in a communiqué. “As part of the fight against terrorism and securing borders, and in a patrol near the Algerian-Malian border strip, a detachment of the People’s National Army coming under the operational sector of Bordj Badji Mokhtar (6th military region) clashed, on 9 December 2016, with armed terrorists, and arrested one (01) foreign terrorist and recovered one (01) Kalashnikov submachine gun, four (04) loaders, three (03) radio sets and two (02) binoculars, as well as a large quantity of munitions,” said the ministry. On the other hand, another army detachment discovered, following a recognition patrol near the border strip, a cache of weapons and ammunition containing eleven (11) Kalashnikov submachine guns, six (06) machine guns (FMPK), one (01) sniper rifle, three (03) semi-automatic rifles, three (03) RPG7 rocket launchers, twelve (12) RPG7 rockets, 15,000 bullets of various caliber,” said the source. “These results achieved confirm, once again, the commitment and the determination of the Army units to guarantee the security of our borders and to prevent any attempt to endanger the national territory’s integrity and security,” said the ministry of Defense in its communiqué. Previous articleHow to lose weight: 5 winter foods that will help cut the extra flab .